For the meatballs: In a medium sauté pan, heat the oil over medium-high heat. Sauté the onions, garlic and mushrooms until golden and pan is dry. Remove from heat. In a food processor, add the toasted bread and pulse until finely ground. Add remaining ingredients and pulse until consistency of ground beef. Form 28 balls and place on a baking sheet. Bake for 15 minutes. In batches, heat 1 teaspoon oil over medium-high heat. Sauté 1/3 of the zucchini for 5 minutes. Season to taste with salt and pepper. Remove from pan and keep warm. Repeat with remaining 2 teaspoons oil and 2/3 zucchini. 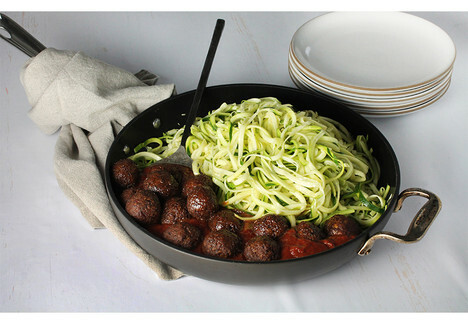 Plate zucchini, top with sauce and meatballs. Tip: To make this a gluten free recipe, replace the bread with Whole Grain Gluten Free Bread.